Ossicular chain discontinuity or malformation causes reduced transmission of sound from the ear drum (tympanic membrane) to the inner ear. This leads to conductive hearing loss. Hearing can be restored with a surgical procedure called Ossicular Chain Reconstruction. Performed through the ear canal, this procedure is an outpatient surgery performed under local or general anesthesia and usually takes 30 to 40 minutes. In the surgery, the ossicluar chain is re-established using various techniques depending on the exact cause. The non-functioning ossicle (bone) may be reshaped to fit properly or removed and replaced with an prosthetic (artificial) implant. 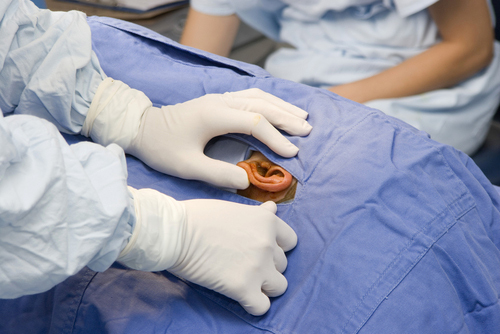 Download Dr. Sperling’s PDF on Surgery for Conductive Hearing Loss.